Ever been to a museum entirely focused around a single material? Ever thought of glass as more than just something you drink out of? At the Corning Museum of Glass, you&apos;ll gain a whole new perspective about a seemingly common place material. Spend a half-hour at a Hot Glass Show, witnessing a molten blob transform into something exquisite and you&apos;ll never look at glass the same way again. Perhaps what truly makes the Corning Museum of Glass sparkle is the interactivity found there. With more than 30 glass shows each day during the summer months, education through entertainment is high on the museum&apos;s priority list. With both indoor and outdoor stages running Hot Glass Shows continuously, there are many chances to see master gaffers (glassmakers) create masterpieces. Enjoy a special &apos;late show,&apos; which is longer, allowing the gaffers time to make a larger piece. During the other seasons, Hot Glass Shows run continuously only on the indoor stage. Make sure to catch the other exciting shows, including a flameworking demonstration, an optical fiber show, and a glass breaking demo. Those three demonstrations are located in the Innovation Center. 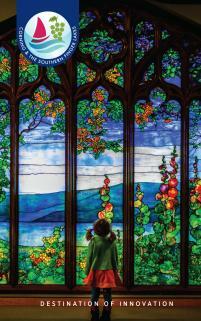 The Corning Museum of Glass is also part of the Tiffany & Treasures Trail. A large, industrial-like room filled with hands-on fun, the Innovation Center is a huge draw for children and families alike. Learn about the technical side of glass and see the amazing advancements that Corning has made in the fields of science and technology. Corning has created everything from heat-resistant Pyrex to glass used in LCD televisions and smartphones. It has been at the forefront of optical fiber development, used to transmit our communications, as well as glass used on NASA space shuttles. In the Innovation Center, take a friend and sit on opposite sides on an enormous glass egg and whisper to each other. Pick up a blowpipe with a big glob of glass on it and see how strong the gaffers at the Corning Museum of Glass have to be. Walk up to a curved mirror and see the tricks glass can play on the eyes. The Corning Museum of Glass is much more than a museum – it&apos;s a hands-on educational experience. Become a glassmakeryourself at the Make Your Own Glass workshop. For an additional fee, you can design your own glass flower, ornament, bead, fusing, or sandblasting project. Sign up for a 40-minute glassmaking session, and create a piece you&apos;ll cherish forever. Imagine having a piece of glass you made yourself? It&apos;s a unique and exceptional experience. The GlassMarket consumes an entire floor of the museum and contains a variety of stores and shops with glass from all areas of the world. Find everything from books on glass to jewelry and sculptures worth hundreds or even thousands of dollars. Wander through the Steuben Glass store, and see the works Steuben gaffers have created right in the same building as the Corning Museum of Glass. EXPERIENCE THE CORNING MUSEUM OF GLASS! The Corning Museum of Glass is open daily from 9 a.m. – 5 p.m., and 9 a.m. – 8 p.m. from Memorial Day through Labor Day. Admission is $20 for adults and $17 for seniors (62+). There are discounts for students, as well as AAA and military members. Kids and teens (17 and under) are free! Also available is a combination ticket with the Rockwell Museum. The Museum is once again participating in the Blue Star Museums program, offering free Museum admission to all active military and their families through Labor Day. Enjoy free admission to the Museum on MLK Jr. Day and Sparkle Weekend, the first weekend in December. See what others have to say about The Corning Museum of Glass on TripAdvisor. Share your adventures at The Corning Museum of Glass on Instagram!